According to county officials, there are many roads in all areas of the county that are flooded from run-off and melting snow. Once the temperatures started to rise, so did the waters in the ditches, creeks and the James River. Several roads are impassable and/or dangerous to travel on. Authorities are asking drivers to take great caution when driving through standing water on roads because it is difficult to know the condition of the road under the water, and, in many cases, the water is still flowing across the road and could cause a vehicle to be swept into the ditch or worse. If at all possible, they ask drivers to take another route to their destination. Everyone is hoping for the ground to thaw and the sun to dry up some of the standing water before there is any spring rain in the forecast. This is also a time when people are more appreciative of the irritating wind that is common in South Dakota. Time seems to pass quickly, and it won’t be long before everyone will be complaining about the unbearable heat. Two men from Miner County went missing while running their route with a garbage truck last Thursday. According to the Department of Public Safety, while the men were traveling north on Highway 37, the truck may have blown a tire or had some type of malfunction to cause them to lose control near the James River bridge just south of the Forestburg Farmers Elevator. The truck went through the guardrail and vaulted an embankment going into the James River. 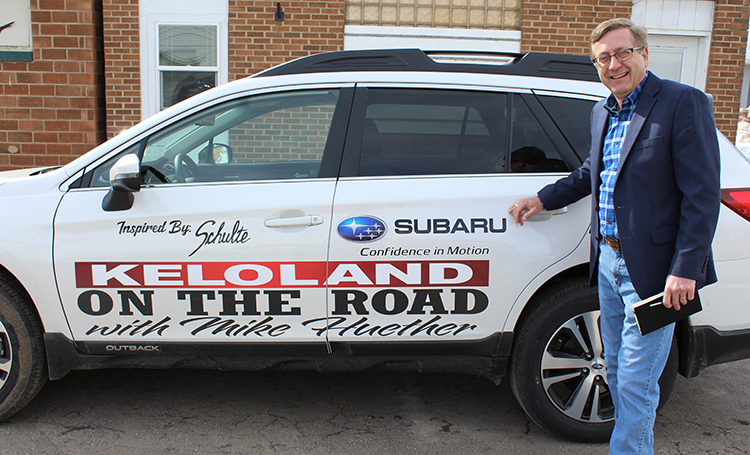 Mike Huether of KELOland News was in Woonsocket working on stories for a new program he will be working on entitiled, “On the Road with Mike Huether.” He stopped by the news office in Woonsocket on Monday to gain information about the community.